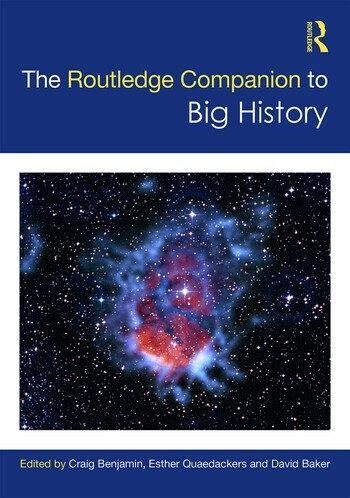 The Routledge Companion to Big History guides readers though the variety of themes and concepts that structure contemporary scholarship in the field of big history. The volume is divided into five parts, each representing current and evolving areas of interest to the community, including big history’s relationship to science, social science, the humanities, and the future, as well as teaching big history and ‘little big histories’. Considering an ever-expanding range of theoretical, pedagogical and research topics, the book addresses such questions as what is the relationship between big history and scientific research, how are big historians working with philosophers and religious thinkers to help construct ‘meaning’, how are leading theoreticians making sense of big history and its relationship to other creation narratives and paradigms, what is ‘little big history’, and how does big history impact on thinking about the future? The book highlights the place of big history in historiographical traditions and the ways in which it can be used in education and public discourse across disciplines and at all levels. A timely collection with contributions from leading proponents in the field, it is the ideal guide for those wanting to engage with the theories and concepts behind big history. 21 The Coming Energy Transition - What comes after fossil-fueled civilization? Craig Benjamin is a Professor of History at Grand Valley State University in Michigan, USA, where he researches and teaches Big History and ancient Eurasian history. Recent books include Big History: Between Nothing and Everything (co-authored with David Christian and Cynthia Stokes Brown, 2014); and Empires of Ancient Eurasia. The First Silk Roads Era 100 BCE – 250 CE (2018). Esther Quaedackers is a Lecturer in Big History at the University of Amsterdam, Netherlands, where she has been developing, coordinating and teaching big history courses for over a decade. She is the inventor of the ‘Little Big History’ approach, which is a research and teaching method in which small subjects are connected to aspects of big history in order to generate creative new ideas about how these subjects came to be the way they are. David Baker is lecturer of Big History at Macquarie University, Australia, and is the first scholar worldwide to achieve a PhD in that field. He is co-designer of Big History School (three K-12 curricula), Big History: Connecting Knowledge on Coursera, and contributor to Big History Project. He was scriptwriter for two seasons of Crash Course: Big History with over 12 million views on Youtube. He has produced numerous research articles, chapters, and edited volumes, including works in the Journal of World History and Proceedings of the National Academy of Sciences.